At Energy Solutions, our goal is to provide Biodiesel and other Biofuel technologies to anyone who is in need. We work with any sector of the market, whether it is a farmer looking to turn his excess crop into fuel or large companies looking for fuel alternatives. We work in a partnership with one of the most distinguished plant builders in the world, Tomsa Destil, to build high quality plants to suit our customer’s needs. Tomsa Destil has been producing industrial plants for over 100 years. Tomsa is a Spanish company and first started producing Alcohol plants for the Spanish market. Since its start, the company has grown into a worldwide leader in producing fuel production plants. Their goal is to provide the highest quality product at a low cost to the customer. They are capable of providing turn-key plants to any country worldwide. To see an in depth presentation of some services Tomsa has offered, as well as clients, please view this Tomsa Presentation. Besides Biodiesel plants, we can also provide other services. One of the largest growing sectors in the United States is the production of alcohol from corn. 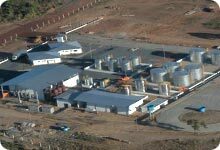 We are fully capable of providing Alcohol plants as well as Methanol and Ethanol producing plants that are efficient in this process and have a low cost. We are also capable of developing Biofuel communities that turn waste into fuel. This includes everything from oil extraction from the raw materials to turning it into Biodiesel fuel. This is an example of a functional community with zero waste products. Please take a look at our Other Services link to see what else we can provide. Also feel free to Contact Us if you need more information. One of the world's leading producers of Biodiesel as well as other industrial plants. They are able to provide the technology, engineering, and construction of the plants.